Simply put, Thokku from Tamil Nadu in India is similar to a pickle, relish, or a chutney. Mostly used as a flavor enhancer to the delicious but bland curd rice, it is a cooked relish or a reduction made from fruits, vegetables and herbs. 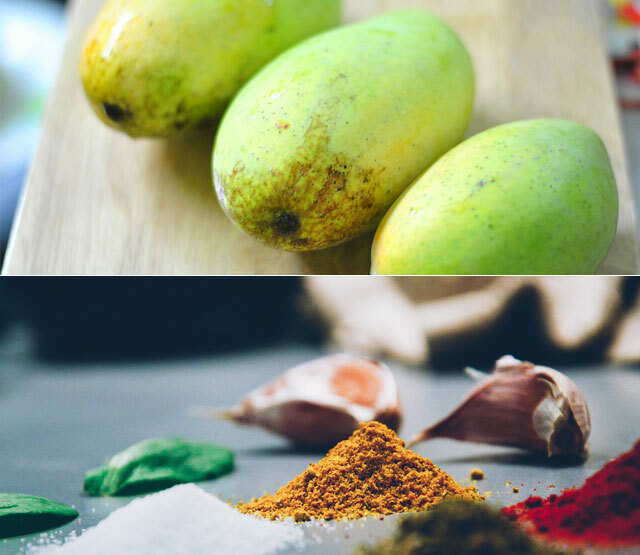 Since we are almost at the end of the yummy mango season, Wicked Spoon Confessions would like to say adieu to the golden fruit with a step by step recipe of sweet sour mango thokku pickle. Check our more ways to savor mangoes here. Wash the mango and grate it but not too finely. Spread it on a muslin cloth so that excess water is drained. Dry roast fenugreek seeds to brown color till a nice aroma starts to emanate. In a thick bottom vessel, pour 50 ml oil and heat. Add mustard when the oil is hot so that it crackles nicely. Add the grated mango, which is spread on a muslin cloth, and mix well. Lower the flame and let is cook well. Keep turning the mango so that its cooked evenly. When mango is cooked soft, add salt and Jaggery. Once the jaggery is added and starts melting, the yellow color will start changing to brown. The pickle will be brown and not be red in color as Chili powder and Jaggery are in equal proportion. Once the jaggery is absorbed by the mango add chilli powder. When the pickle is very hot and chilli powder is added it tends to turn black and so add chilli powder only at the end of the cooking process. Cook for one to two minutes more and switch off. The chilli powder will cook in the heat of the vessel and the red color will remain red. Let it cool transfer it to a glass jar. This pickle will be a nice accompaniment for curd rice, phulkas, upma and any mixed rice like tomato bath or lemon rice. Shri Bala is a Chartered Accountant & Company Secretary and an Author of the fiction Y?Me . . . based on a Chef's life post 26/11. She is a food aficionado with in depth knowledge of South Indian Vegetarian food. She recently conducted a South Indian Food Festival under the aegis guidance of Executive Chef Ashish Bhasin of Trident BKC Mumbai.